This post is here to give you a crash course on how to use an Internet Web Browser. In the image below we have three internet browsers Firefox, Google Chrome, and Internet Explorer or IE. All of them basically offer a similar interface. Under the green arrows you find the address bar of all the three web browsers. In the address bar you type in the http://www.theComputerManual.com, or you can type TheComputerManual.com and press the Enter (Return) key. The Google browser, Chrome, unifies its search bar with the address bar, therefore if you type a phrase it will just search for it, but if you type d domain name, of the format (domain.com) then it will automatically direct you to the domain name. Under the red arrows you have the browser tabs. Back in the old school you could only have one browser window. So if you were interested in opening multiple web sites at once, you had to open multiple browser windows. Now with browsing tabs you can have one Browser window and multiple websites open in multiple tabs, under the same browser window. Under the blue arrows you have the browser search bar of course in the Google Browser you only have one bar which saves both purposes, but the blue arrow is there just make sure you don’t get confused. If you want more information on web searching just follow the basics of Internet Searching. This paragraph is just in case you are really novice on the Internet and somehow you managed to land yourself on this page. All web browsers offer you the possibility to save favorite websites to which you will want to navigate a t a later time. You can save any internet link on these websites to your browser’s bookmarks or favorites. In Internet Explorer you click on the favorites menu and then you just hit Add to Favorites. You can organize your bookmarks or favorites into folders. 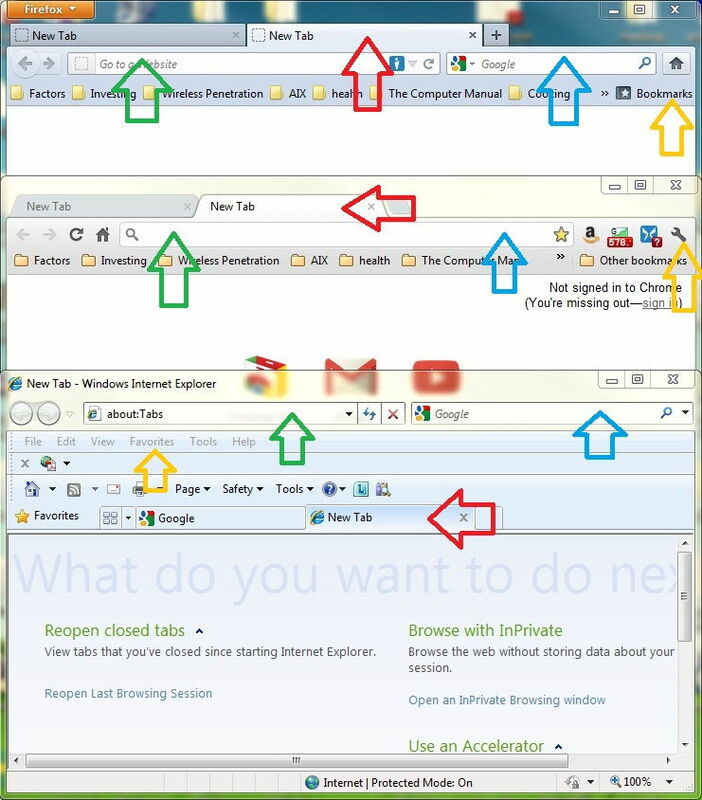 If you look at the other browsers in the picture you can see folders in toolbars of Firefox and Google Browsers.